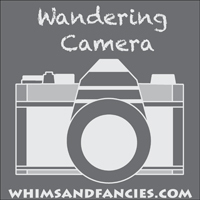 Today is my day to share my project for the Black and White Blog Hop. Thanks so much for our super talented host, Carla, for organizing this hop. I went a different route for this hop by creating a Figet Blanket. These are used in memory care facilities for the patients who enjoy the textures, colors and interest of the blankets to occupy their time and give them something to handle with their busy hands. At approximately 15 x 20 inches, it easily fits on a lap or table top. The recipient of this one is a long retired teacher who continues to love to read words. She was also a seamstress. There are so many wonderful text prints out there now so I dug through the stash and picked some that I thought would be interesting for her. Once opened, you can see all of the items of interest to handle and feel. Starting in the corner, there is a working watch sewn onto a clock fabric background. There are keys, a spring and a velcro tab with a chalkboard background. 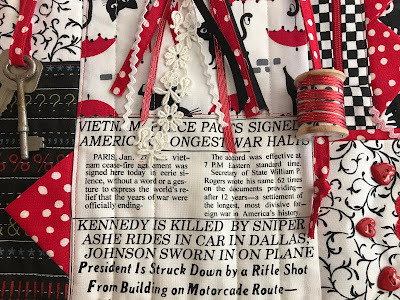 More word fabric that has news stories of perhaps distant memories. There is also an old wooden spool with red "thread". Hiding out in a lower pocket is a finger puppet of a little mouse. The pocket has added buttons and applique for more tactile stimulation. There's a zippered pocket that has a zipper pull for easier access and can hold treasures - a plastic room card, a comb, a toothbrush and a squeaker toy. The added prairie points throughout add even more texture and interest. The middle finishes off with more text fabrics of sewing terms and cats with red umbrellas. Sewn to that are multiple strands of textured strings - ribbons, ric rac, lace and cording. 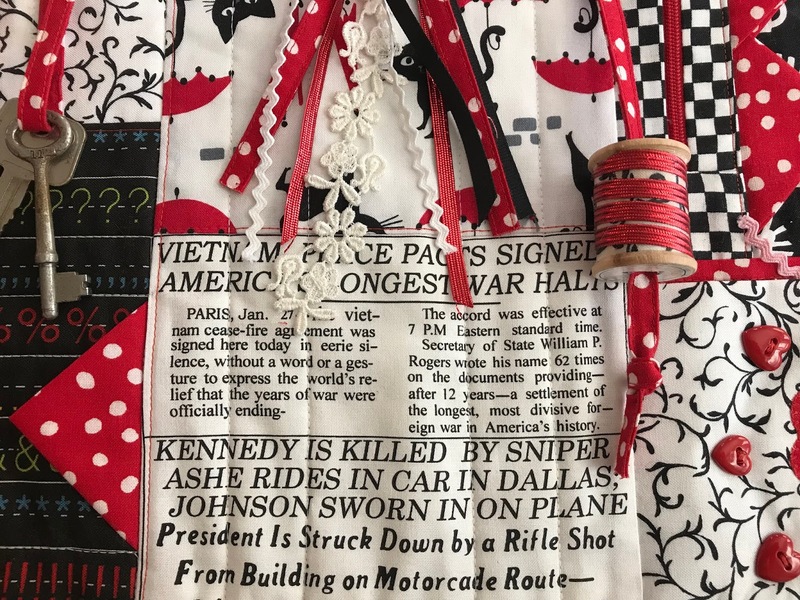 Should you know of someone with memory issues or should you have a memory care facility near you, I recommend that you search your fabrics and bits to make a few. They are enjoyed for hours each day. A hint if you make them would include sewing things down well. I stitch down all knots so they cannot be untied, thus making the items removable. You do not want small objects becoming choking hazards. They are really fun to personalize if you know the recipient's interests. Please be sure to check out the other participants in this weeks Black and White Hop. I know that I am looking forward to seeing all of the creations. Very creative, and the pop of red is perfect. This is such a lovely gift. Our guild is going to make fidgit quilts this summer for an Alzhiemer Ward. Thank you for sharing your Figit Blanket - it is amazing. What a wonderful and thoughtful project! The pops of red are perfect! 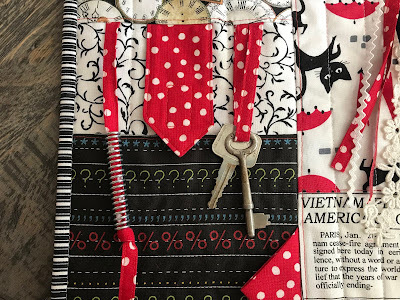 That is a very thoughtful and caring version of a fidget quilt. I find it incredibly sad that such things are required, but I'm sure the recipient will find some comfort in the personal touches you have included. Beautiful job! 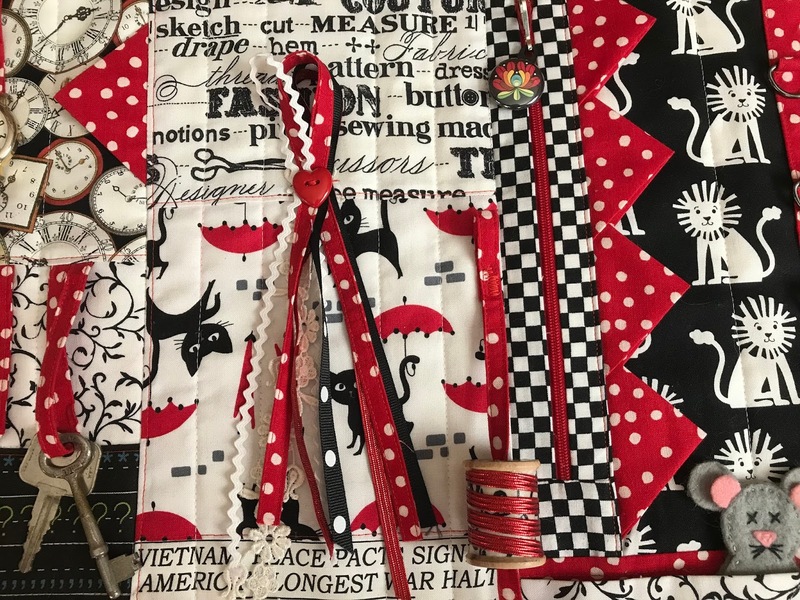 Love your fabric and fidget selection. 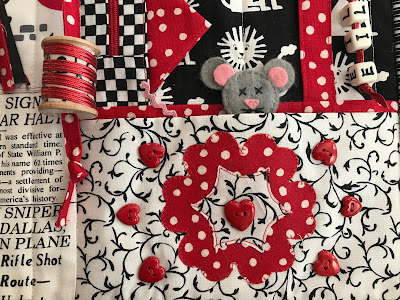 What a beautiful fidget quilt and so fun, too! I love this idea, especially since I spent a lot of time visiting memory care units while taking care of my German lady. This would be such a nice gift! Great work! The recepient will have a wonderful gift. What a great idea! and a great blanket. I love all the little bits and pieces you put on it. 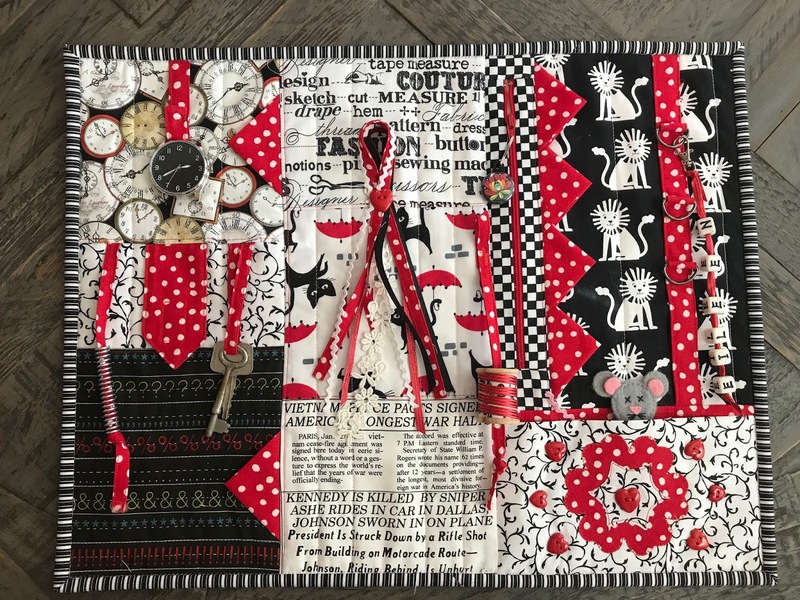 Mary, this is one of the nicest fidget quilts I've seen. I love it in the black, white and red and how wonderful that you used all of the text prints for your friends reading pleasure. Great finish and what a wonderful gift. Your fidget blanket is fabulous and such a splendid idea! This is just about the sweetest thing, and the little mouse is over-the-top cuteness! Your friend will love her little fidget quilt! A couple gals in our quilt ministry have made these little quilts for relatives in nursing homes, and I'll be sure to show them photos of yours for more inspiration. OH my soul, so very neat, Mary...love it! Wow what a clever, and beautiful, project! What a wonderful concept, and you worked it to the max. Your friend will truly enjoy it for hours on end. Thank you for sharing your fidgit blanket with us and for sharing the story behind it. This little blanket has so many wonderful features! But the wee mouse is my favourite. Lots of love and care are sewn into this treasure! THANK YOU FOR SHARING, LOVE THE IDEAS. What a wonderful idea! I'm sure that she will love it. Great idea and love all the different items to fidget with. 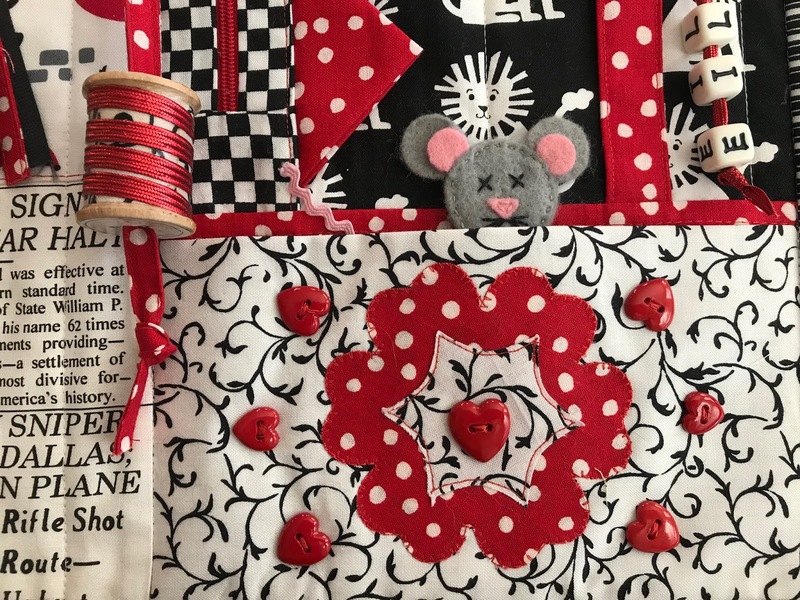 Your ideas for the fidget quilts are quite wonderful. I've been wanting to make some after my commitment list is finished. What a great gift! yours is so sweet! Oh, such a great idea! 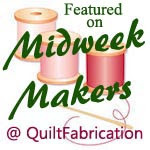 And a creative project for those of us who may have loads of past crafting supplies. I can think of my ribbons, charms from scrapbooking, etc. And I am sure there are many care facilities that would accept these. The growing popularity of fidget blankets is heart warming and bittersweet because of all it tends to. 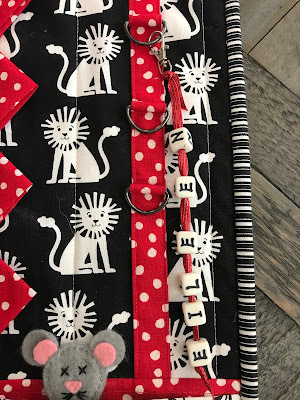 Your fidget blanket is the finest one I've seen because of the many creative sewing details. I am so grateful that I visited your blog. I am also a retired RN so we have that connection as well as being quilters. Blessings to you for being such a thoughtful friend and making this gift. I am going to make a couple for elder relatives. You are inspiring. I started making one of these for my FIL, but his mental state and health deteriorated too quickly. 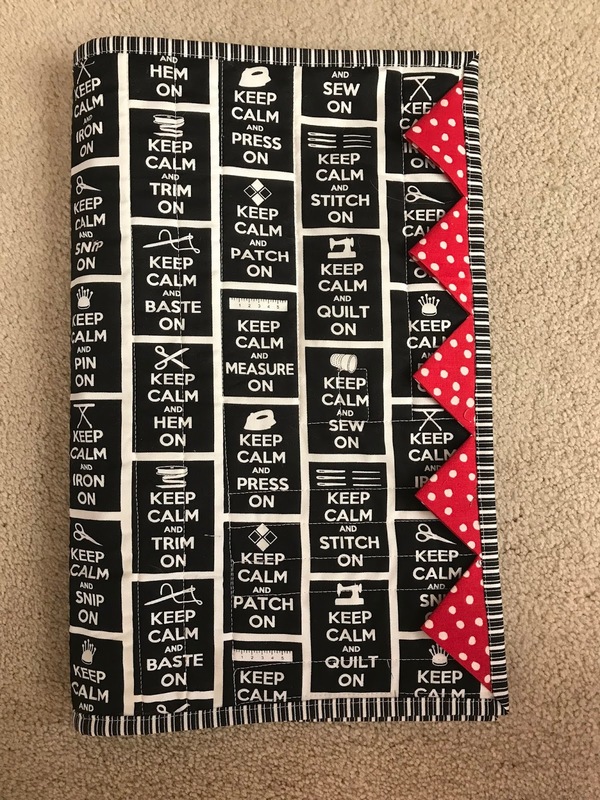 This is so wonderful for someone who loves words and sewing. wow this is amazing. thanks for inspiring. Such a thoughtful and interesting gift! Great use of your Black and White! What a wonderful and special quilt. I am sure the recipient will be very pleased getting such a thoughtful and pretty quilt. That is absolutely awesome. What a labor of love and searching for the perfect fabrics really makes it personal. You have done a spectacular job! Wow,Mary, this is truly inspirational! What a neat collection of fidgety fun ideas, It's brilliant that you used text prints just for her. I have been meaning to make some fidget quilts myself. Thanks for the great ideas. Mary, this is incredible. Every little detail is so well thought out. You have certainly given me inspiration. If you ever make this a pattern I would love to have it. A huge thank you for joining the B&W Hop. Your post is so motivational. We should all be as considerate as you. Love this! I'm sewing with a group next week to make some of these for hospice patients as well. Thanks for sharing! You did a wonderful job on that fidget blanket. With all the different things it will probably get a lot of love. I'd never heard of a fidget blanket. 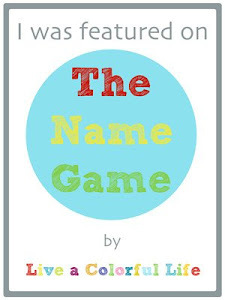 This is the most wonderful gift for someone in memory care. Thank you for sharing. This is a lovely gift for your friend. I had never heard of them but will definitely keep it in mind now that I have. Thank you for sharing. Fantastic detail on this - it should be quite the hit! This is amazing! 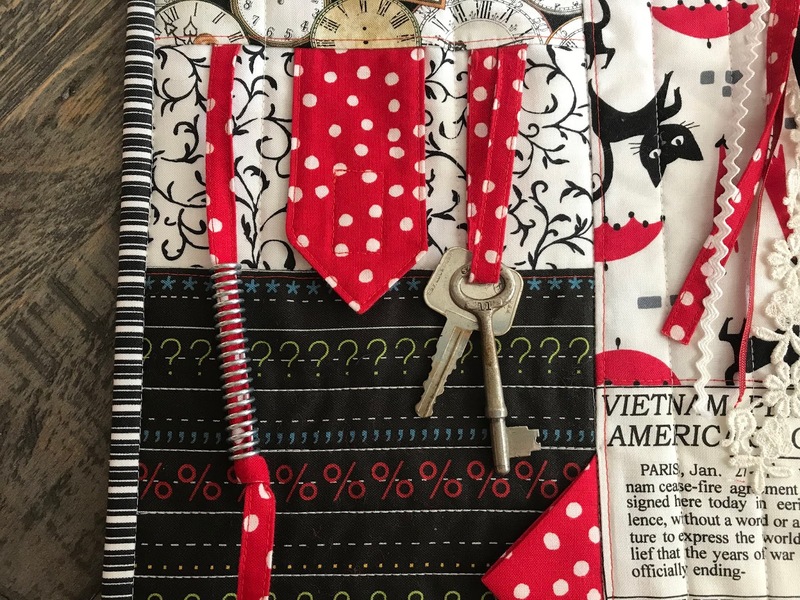 I loved reading about your fidget quilt, as I know I'll need one in my (hopefully, far off) future, but can also think of others who could use one. All your details are precious, and thoughtful, and hopefully will give her a lot of pleasure. Did you have a pattern, or just go to it, adding and thinking up things as you went? So fabulous! She still loves it and shows it to me every time we FaceTime! The squeaker drives Layla crazy; she thinks I bought her a new toy every time she hears it and runs around the house looking for her toy. what a very impressive way to help others. I applaud you for thinking of others and teaching many of us a new way that we can help other. 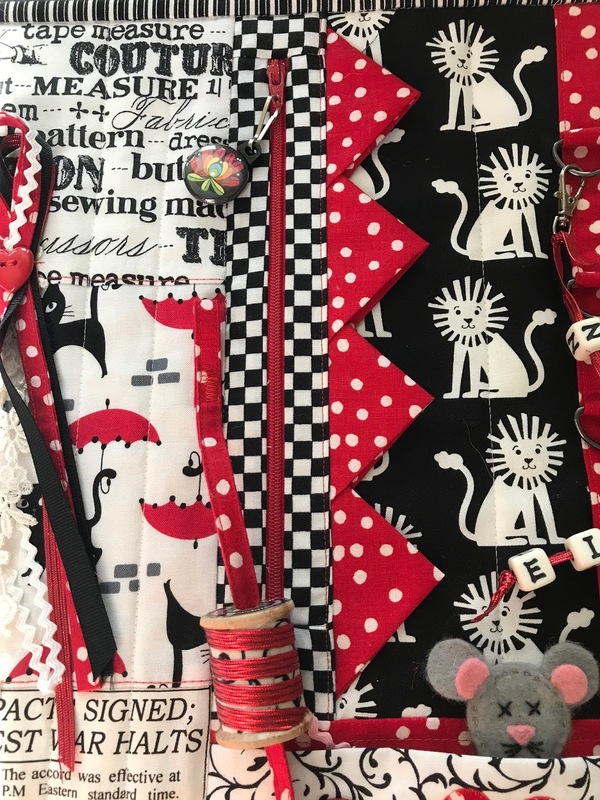 So you have not only helped the person you made the fidget blanket for but for each of us who you have taught to make fidget blankets your contributions is a gift that keeps giving and giving. Thank you so very much. This is one of the prettiest and well thought out fidget blankets I've ever seen. She's going to love it. That is such a clever idea and I love the fabrics that you used. This such a wonderful project, suited perfectly. She going to love it! 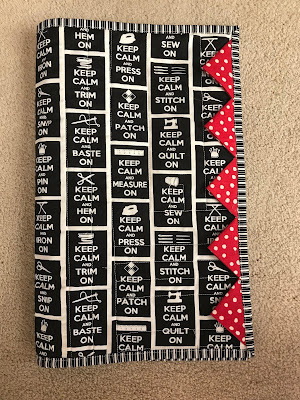 This has the be the nicest fidget blanket I have ever seen , I am sure the recipient will get many hours of enjoyment feeling and touching the various items you have chosen . I have always wanted to make fidget blankets but I am afraid of not attaching things secure enough. Very pretty. Wow that is one great fidget blanket. I'm a fan of the red, black and white too. This was a fantastic post to read! There are so many thoughtful details that went into that quilt for this elderly lady. I love it! What a fantastic project, and so well-done! I am a home-bound extra-ordinary minister for our church so regularly visit memory-care facilities. I know they would love to have something like this! Will definitely file this away as I think it would make a great group sewing project! 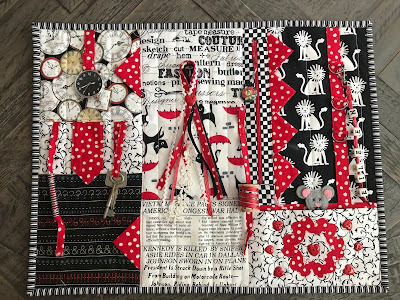 A fantastic Fidget Blanket made for your B/W Blog Hop. This is a very thoughtful and useful project. You included many things that will have special meaning for the recipient. Mary, what a great quilt! I am not in a category to be receiving a fidget blanket YET. However, I have always been a fidgety person. I always have to be doing something. Now that I am officially disabled, I am on my laptop most of the time looking at ideas for quilts, cross stitch, or knitting. I do knit once in a long while - easy things like dishcloths. I get bored easily and want to switch projects. Sometimes I have more than one dishcloth on different needles at the same time. I did buy Aida cloth for two cross stitch projects and have not started them yet. I appreciate your telling how important it is to secure the items on the blanket. I went through the end stages of dementia with my best friend and her mother. I didn't know them until the end stages. It was sad. My father had Parkinson's and it was a tragic disease, too. You put immense thought into this and you will be blessed for it. I hope Eileen loves and appreciates it to the extent possible The bright red should catch her attention, too. Thanks for sharing a wonderful project! Those prairie points on the back absolutely MADE the quilt!! What a thoughtful gift. I want to make some, where did you get the pattern? I just love yours, if there is not a pattern, can I copy yours? I won't make a pattern to sell, just for me to make for the assisted living my mother is in. What an awesome quilt!! I love all the fidget details that you added. My favorite is that little mouse finger puppet! And what a wonderful gift that's sure to keep fidgety fingers busy. This is wonderful! Your fabric choices and objects are perfect for the recipient. I made one of these many years ago and know that it was well-liked and used. Your post is a gentle reminder that I should consider doing this again. 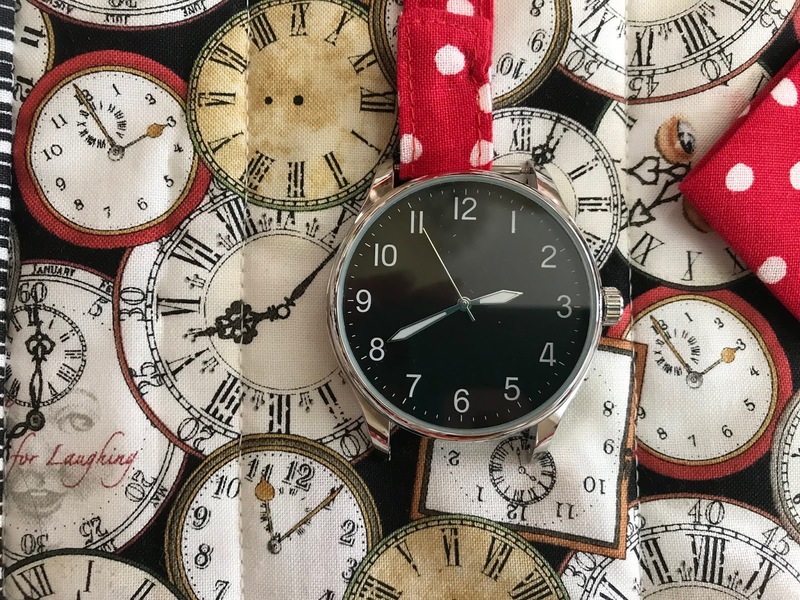 Love your project and that clock fabric. 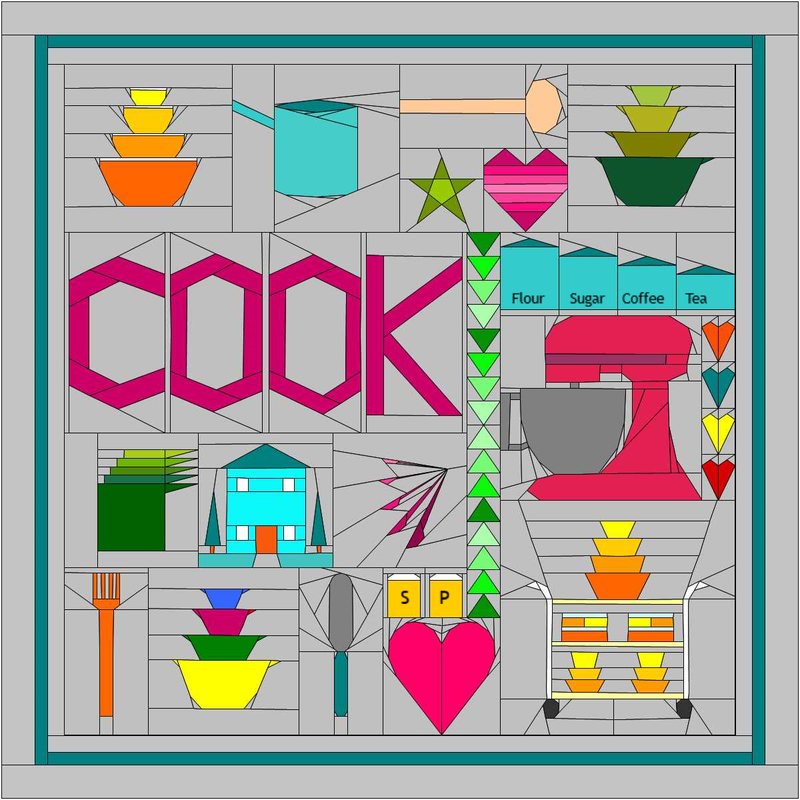 I have been looking for a clock for the wall on my stone soup project. Thought i had one but i dont. The care you put into your fidget quilt is amazing. What a gift! What a wonderful idea! So clever. You have outdone yourself with this one, Mary! Such a thoughtful gift. I am amazed by all the wonderful, beautiful details you added. 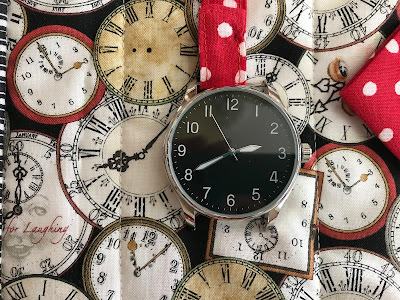 The watch is my favourite and the chalkboard fabric is so great for a teacher. Thank you so much for sharing. Oh, this memory quilt is amazing, Mary! 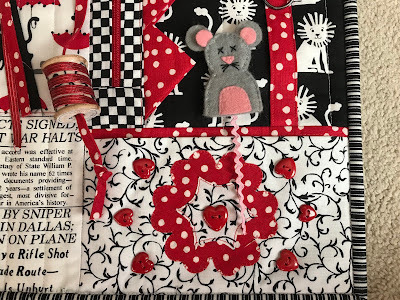 I love all the fabulous details that you have imagined and then put onto the quilt. One could look at this beautiful quilt for hours and have many memories come to mind. Love the idea of a clock that tells the time. Such a fun and important quilt to gift to a teacher.